Henrico County, Virginia is one of America's oldest counties, having been established in 1611. Present-day Henrico County borders Richmond, Virginia's state capital. Henrico County is comprised of five districts: Brookland, Fairfield, Three Chopt, Tuckahoe, and Varina. Note: For details and to rent space at the Friends of Meadow Farm Yard Sale on Saturday, May 18th from 8:00am-1:00pm, please visit our Shopping page. Come to our 2nd Quarter Meeting scheduled for June 2nd; see Events for further details. The Friends of Meadow Farm Yard Sale, co-hosted with HCHS, is Saturday, May18th, from 8:00am-1:00pm. For details and renting space, please visit our Shopping page. The USS Henrico APA-45 provided 25 years (1943-1968) of service in the Amphibious Forces of the United States Navy. The list of crew members who have died after their military service has been memorialized on the ship crew's website. The website contains information about ship's history, memorials, and ship's company, and includes a photo gallery. Visit Henrico Library's Notable Henricoan database. For more information, visit http://Eventshenricolibrary.org/nhdb/. It's time to renew your HCHS membership, or perhaps purchase a new membership; see Membership. For our HCHS members, if you are interested in receiving occasional emails with reminders and updates, such as upcoming quarterly meetings, please supply your name and email address to HCHS email address of hchsinfo@yahoo.com. Your email address will not be shared and will remain confidential in HCHS' membership database. Thank you. 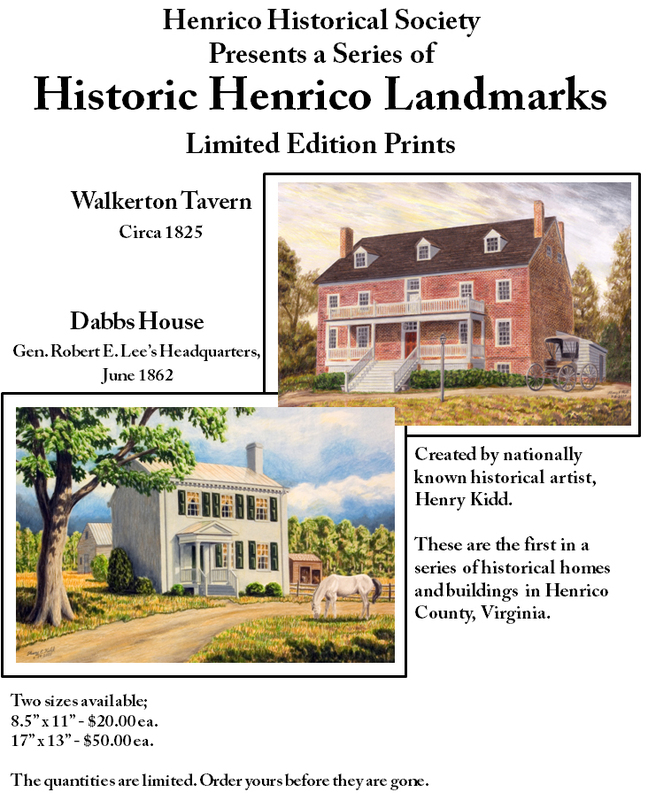 Purchase from HCHS your limited edition prints of Walkerton Tavern and Dabbs House (General Robert E. Lee's Headquarters in June 1862) created by nationally known historical artist Henry Kidd! These are the first in a series of prints of historical Henrico County homes and buildings! Order before they are gone! Henrico County Historical Society magazines from June 1976 to March 1995 about Henrico County available for purchase.